New Holland dealership, Farm and Garden Products recently opened the doors on a new multi-million dollar facility to meet the rising demand for mining and earthmoving equipment in the Bowen Basin Coal mining region of Australia. The current boom in the Bowen Basin Coal mining region, 300km west of Rockhampton is driven by the growing demand for coal from China, the world’s top consumer of coal. This growth trend is expected to continue with reports that India will emerge as one of the largest markets for coal by 2035. The coal mining boom is fuelling demand for mining and earthmoving equipment right across the region. According to Kristian Keleher, New Holland Construction Sales Representative for Farm and Garden Products, skid steer loaders and excavators are selling strongly with the equipment being used within the mines themselves, and by subcontractors working on residential developments being undertaken in an effort to house the region’s increasing population. New Holland’s new range of L200 Series skid steer models is particularly popular due to operator comfort and industry-leading visibility. A C227 track model is currently in use at the Middlemount coal mine, 300km north-west of Rockhampton as part of the construction efforts for a new water pipeline being laid and for loading and unloading of materials at the project site. The New Holland C227 skid steer loader was selected for its increased traction and flotation capabilities, which ensure they can keep working even in the wet conditions prevalent in the region. In addition to the coal mining boom, continued growth in the region’s agricultural sector is also driving ongoing strong sales of New Holland Construction’s new L200 Series loaders. The L225 is particularly popular due to its lift capabilities, easily lifting a tonne of material and making it ideal for use in a market where most produce deliveries arrive on one tonne pallets. The new purpose-built facility opened by the New Holland dealership aims to keep up with market demand for equipment. 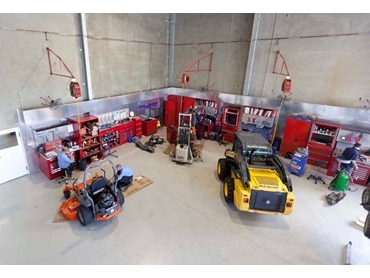 The facility also includes a state-of-the-art workshop that will service equipment brought in from within a 300km radius. The fast growing mining and agricultural markets are expected to increase the use of Holland gear across the region.